At up to 3,600 meters of altitude, snow is absolutely guaranteed. 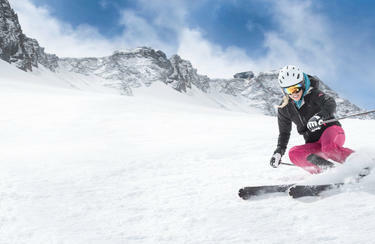 In Saas-Fee you will find numerous possibilities to indulge the winter sport of skiing extensively. Try your hand right the moment at freeskiing - appropriate equipment for your off-piste ski adventure you can receive at INTERSPORT Glacier in Saas-Fee. Get also equally valuable safety tips by the expert INTERSPORT Rent team. Inside information on the best hotspots of the region are for free. Your feet will enjoy the skiing in Saas-Fee! Why? Because INTERSPORT Glacier Sport offers professional ski boot fitting. To ensure that no toes are compressed and the shoe doesn´t presses, modern technology provides great comfort. Vacuum technology and professional footbed adaptation guarantee a maximum of safety, comfort and driving pleasure on the slopes.